England scored nine tries while thrashing France 39-13 in Paris in the last Championship match staged before the Great War. Legendary wing Cyril Lowe scored a hat-trick, but even this scoring feat was outdone during the game by skipper Ronald Poulton who crossed the line on four occasions. The game proved to be Poulton's last for his country. His life was tragically ended by a sniper's bullet during fighting at Ploegsteert Wood in 1915, he was 25. 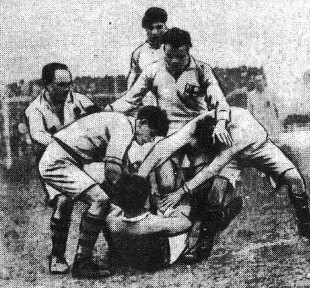 By the end of the war six of the English side (Robert Pillman, Francis Oakeley, Arthur Dingle and Bungy Watson as well as Poulton) and five of the French XV (Marcel Bergun, Jean Larribau, Felix Faure, Emmanuel Iguiniz, Jean-Jacques Conilh de Beyssac) were dead. France came close to defeating England for the first time, losing 13-11 in Paris. Winger Richard Hamilton-Wickes and skipper Wavell Wakefield were on the scoresheet for England, while lock William Luddington also chimed in with a conversion and a goal from a mark. At Gloucester, England won the return Red Cross international against Wales, 17-3. A young Jack Matthews made his representative bow for Wales playing in the centre alongside his captain, Wilf Wooller. Matthews went on to achieve 17 caps for Wales and six for the British and Irish Lions, forming one of the all-time great centre partnerships alongside Bleddyn Williams for Cardiff and Wales. Munster followed Leinster into the semi-finals of the Heineken Cup with a memorable 20-7 win against Leicester at Welford Road. The Irishmen come from behind to steal the match in the final 20 minutes. Harlequins completed the signing of former England back-row forward Tony Diprose from Saracens. Diprose won 10 caps for England between 1997 and 1998, skippering the side against Australia in 1998 on the so-called "Tour to Hell". Bath furthered their chances of surviving in the top flight with a 23-12 victory over fellow Premiership strugglers Leeds. Bath ended a run of five league defeats and managed to deny their rivals a bonus point with an injury time try from centre Olly Barkley. Scotland, the team of the season, scored six tries to overwhelm England 27-0 in the "Victory" international at Murrayfield. In fairness, it was hardly a representative England XV and they played with as few as 12 players at one time due to a series of injuries with their six-man scrum unsurprisingly being outclassed throughout. South Africa lost to a Scottish Provincial side for the first time, going down 16-8 to a Scottish Districts XV at Hawick.